I’m probably one of the biggest Henry Hatsworth fans on the site, as you can plainly see in my review of the game. I have also recently reviewed Henry Hatsworth creator Kyle Gray’s team-up with World of Goo developers Allan Blomquist and Kyle Gabler, Little Inferno, and I greatly enjoyed it as well. I have now decided to follow-up on some of the other Henry Hatsworth alumni and take a look at Monster Tale, the first game by DreamRift, a studio founded by two key developers of Henry Hatsworth, lead designer Peter Ong and leader programmer Ryan Pijai. Whereas Little Inferno took more of its influence from the World of Goo developers on that team, Monster Tale draws very much upon Henry Hatsworth, and I might go as far as to call it a spiritual successor of sorts (albeit more in the DNA of the game than in the specifics.) But is that enough to keep a Hatsworth fan like me happy? Graphically Monster Tale is a very pleasant to look at game, utilizing sprites and animations that could almost be out of an SNES classic, if a bit cleaner than SNES games were capable of at the time. The backgrounds are particularly well designed, and add a real sense of style to the game, taking some themes that could have come off as rather generic (ruins, forest, water, etc.) and adding real flavor to them. 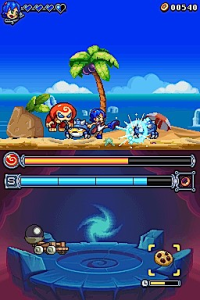 Most of the environments are broken up into several sub-sections that are specific variations on the core environment, for instance, the water environment is made up of the beach, the aqueducts, and the tubeworqs, and all three of them have a distinct feel from each other, not just in the art style, but in the game design as well. Add in a great soundtrack and there is a lot to love on the presentation side of things. A big selling point of Henry Hatsworth its usage of both of the DS screens, and Monster Tale follows a similar path. 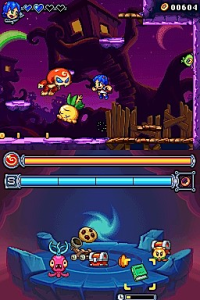 In Monster Tale the main action happens on the top screen, while the bottom screen is a sort of retreat for Chomp, where he can interact with various items, gaining him XP to increase his stats, as well as recharging his health. 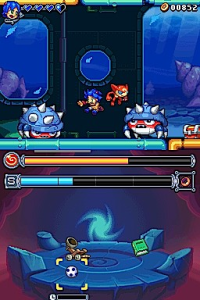 On occasion enemies will invade the bottom screen, and Chomp must be sent down to take care of them, or they can sit down there out of Ellie’s reach causing trouble for you on the top screen. 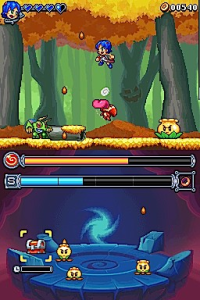 The dual screen mechanic is certainly a plus to the game, although it is a bit more subdued than it is in Henry Hatsworth; once you send Chomp down to the bottom screen there really isn’t that much for you to do down there other than select the order in which Chomp will perform his actions and let him get to work. Another core feature of Monster Tale is using the XP gained to help Chomp evolve, growing him into more powerful versions of his current form, as well as partaking in sideways evolution resulting in different forms that aren’t necessarily more superior, but might better match your play style. 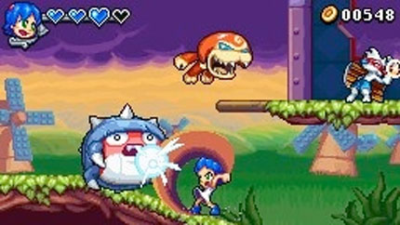 Chomp can also acquire various traits that can be assigned to the L and R buttons and used during battle, and many of these traits are tied to specific forms. It’s fun to play around with Chomp’s various forms a bit, but I rarely found that they made that much of a difference, and I usually just stuck with whichever form looked the coolest. Furthermore, switching to a new form removes the traits that you had selected and forces you to select your traits again, even if those traits were ok to keep on the new form. A minor annoyance, but an annoyance nonetheless. A stroll at the beach, a walk in the woods... how serene! Chomp isn’t the only one who can gain new powers, as Ellie will acquire several new abilities throughout the game as well, many of them loosely connected to a special band that she wears. I suspect that the developers took a long, hard look at Mega Man X when coming up with Ellie’s upgrades, because a substantial amount of them are so nearly identical to X’s upgrades that I can’t believe that it is a coincidence. I don’t want to spoil everything that Ellie will acquire, but a charge shot, a double tap dash, and a wall kick are definitely in the mix. As a huge fan of Mega Man X, I can’t say that I am displeased with this blatant borrowing. And much like Mega Man X, the controls are pretty spot-on, although I did have some trouble charging up my shots while jumping, as the shot is relegated to the A button, when the Y button (used for the melee attack) might have worked better. Unfortunately there are no options to switch the default controls. Let’s get into the game design. 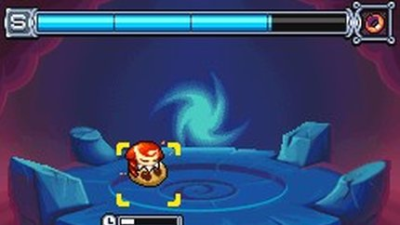 Monster Tale follows the general structure of a “Metroidvania” title, where you move around a huge, interconnected world in a non-linear fashion, acquire upgrades, backtrack, and unlock new areas to explore with those upgrades, completing platforming challenges and defeating enemies along the way, with an occasional boss fight to keep you on your toes. Generally Metroidvania progression is one of my favorite ways to play through a game, but in Monster Tale it falls short in some ways. The ideal Metroidvania game makes backtracking interesting by working your new upgrade into the exploration and having you utilize it in novel ways beyond simple “blue key opens blue door” puzzle solving, and it rarely makes you backtrack too far without giving you ways to transport yourself quickly and efficiently, as well as allowing you to discover new secrets or open new paths along the way. Monster Tale, however, has you acquiring new upgrades at such a frantic rate that only a small handful of them are ever used in any meaningful way, and it often makes you run all the way across the world to grab a new upgrade through areas that play exactly like they did the first time you ran through them, just to run all the way back again to use the upgrade once and forget about it. I’m not saying that all of the upgrades are worthless, but their worth is mostly revealed in the combat system, leaving the Metroidvania progression mechanic feeling not only like a bit of a missed opportunity, but at times an annoyance, especially near the later half of the game when the world has grown so large that backtracking just to acquire an upgrade can take a significant amount of time. Furthermore, your next destination is almost always pointed out to you on your map, and there is rarely anything to discover on the route to it, which makes Monster Tale feel excessively linear for a non-linear game. The items can pile up on the bottom screen if you ignore them for too long. If you have played Henry Hatsworth, the combat of Monster Tale will definitely feel familiar. The combat is one part melee, one part shooter, and you can choose to focus on whichever is your preference, although certain situations will call for one over the other. The one major difference between the combat of Henry Hatsworth and Monster Tale is that instead of playing a puzzle game to enhance your combat, Monster Tale will have you utilizing Chomp and his various abilities, using them to support your basic attacks. For the most part this is a smooth and satisfying process. Monster Tale is fairly easy for a good 50-75% of the game, which makes the combat system feel a bit boring for a bit too long, but when it does finally pick up, there is a lot of challenge involved and the combat starts to feel more satisfying. With all of my comparisons to Henry Hatsworth, you may be worrying that Monster Tale gets to the same Hatsworth levels of frustrating difficulty that many complained about in that game (not me!) Fear not; for Monster Tale is ultimately an easier game than Henry Hatsworth, and although it does have a few random “kill rooms” such as the ones in Hatsworth that brought about the ire of many gamers, they are much shorter in duration and less of an obstacle to moving forward in Monster Tale. Monster Tale is not a particularly long game, and it took me about seven hours to travel through the five worlds and complete my quest. This is probably on the high side for 2D Metroidvania games, but if they had taken out some of the pointless backtracking Monster Tale would be a shorter game than it is. Still, it doesn’t get to the point where it overstays its welcome, which is always a good thing, and you can pick it up on the cheap nowadays, so the value is there. Monster Tale may not quite live up to the promise of a “Metroidvania from the makers of Henry Hatsworth”. There is too much of the wrong kind of backtracking, too many upgrades for each to stand out, and it takes too long for the difficulty arc to pick up. However, there is a lot that Monster Tale does right, from the style and presentation to the tight controls, and despite there being too many upgrades, some key ones for both Ellie and Chomp are definitely worthwhile. Monster Tale starts off a bit slow, but I do feel that it becomes more satisfying once your abilities are fleshed out and the challenge finally kicks in, despite the satisfaction being subdued a bit by a few too many pointless treks across the entire map. It’s not the best Metroidvania game on the DS (for that I would go with Castlevania: Dawn of Sorrow or Shantae: Risky’s Revenge), and it has some flaws that can’t be ignored, but the good outweighs the bad and creates a generally positive experience. If you’re in the mood for another 2D sprite-based gem for your DS, Monster Tale is a solid one that you may have missed. At the end of the day, isn’t this what we all really want? Still charming and enjoyable though. Seriously though, while Monster Tale is a disappointment after Henry Hatsworth, it's a fun little game. It's just not as well designed as some of the other Metroidvanias out there. And to be fair, Henry Hatsworth is a tough game to top. Didn't even finish it... just wasn't enjoyable and not only because of the backtracking. Good to see some found a good game in its faults. I was always interested in this game, especially because of its pedigree. Thanks for the review Zero! @VofEscaflowne How far did you get? As I said, it took awhile to grow on me. Near the end, when you are all powered-up like Mega Man X, it feels pretty tight. Albeit, near the end is also when the backtracking can get even more ridiculous, because you have a big fat open map to run all the way across now. What IS the deal with backtracking? Don't people know we don't like that stuff? And like you mentioned, why NOT put something along the way if you NEED to backtrack? It happens all the time in other games; heck, in Arkham City, if you had to go back to some place you've been before, chances are it is chock full of bad guys again, and often with brand new dialogue! Also, "looking cool vs. doing well." Don't we almost always take the "looking cool" option? I can't tell you how many times people ragged on my awesome Bone Mail in Monster Hunter Tri. You better believe when 3U comes, I'll he right back in that crap. Looking cool for Chomp; did that hurt you in the end? Did he still have some rad abilities?